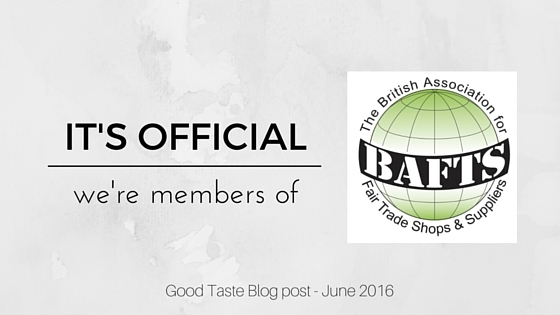 We are excited to tell you that we are now full members of BAFTS (The British Association for Fair Trade Shops & Suppliers). BAFTS brings together independent shops and suppliers who are united in their core purpose to bring about fundamental changes in the status of developing world producers, through Fairtrade retailing and campaigning. Membership is awarded to shops selling more than 70% Fairtrade products and adhering to the World Fair Trade Association’s ‘Ten principles of Fairtrade‘. To become a member we needed 12 months trading figures. We completed a comprehensive form, detailing our purchases from all our suppliers and showing how ‘The 10 Principles of Fairtrade’ underpin everything about our organization. The form was then submitted to the BAFTS application panel and to all BAFTS shop members for comments, and a collaborative decision about our suitability was made. Membership is a great step forward for us, as the rigorous assessment criteria is a validation for us as a shop. It assures our supporters and customers that we walk the walk as well as talking the talk. Buying and selling fairly traded products is our way of making a difference in an unequal world. We encourage our customers to discover the stories behind the products – to engage in a small way with the individual who created the beautiful item they are purchasing and whose life is transformed with each and every purchase. We are grateful to all our volunteers, customers and supporters who have helped us achieve our BAFTS membership. Point to ponder: One man can’t change the world, but you can change the world for one man. Visit the BAFTS website to find out about their history and their future aims. Also check out other members to find out their stories and locations across the UK.